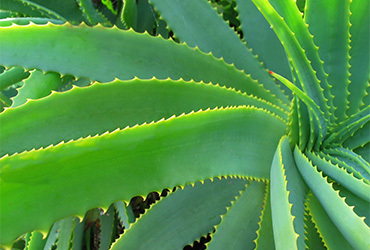 Aloe Vera is a cactus-like evergreen plant that belongs to the tree lily family. It is native to the Mediterranean area in Europe and to Southern Africa but is now cultivated in many regions of the world. The mucilaginous gel obtained from the leaves of this plant is widely used in beauty and personal care applications. The gel is especially soothing and is comprised of over 200 constituents including polysaccharides, enzymes, glycoproteins, amino acids, vitamins and minerals.